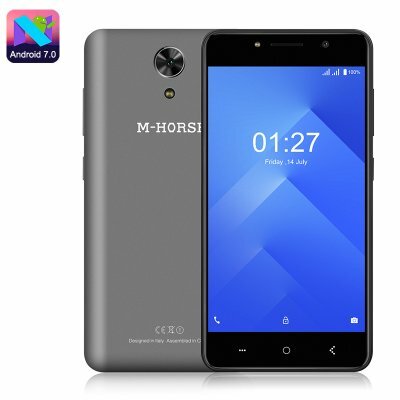 Successfully Added M-Horse Power 1 Smartphone - Android 7.0 OS, Quad Core CPU, 5050mAh Battery, 5 Inch HD Display, Dual SIM (Grey) to your Shopping Cart. As you may guess from the name the M-Horse power 1 smartphone is all about power. With its large 5050mAh battery it certainly ticks that box. This incredible phone can be used for days on end without needing a recharge. Perfect to keep up with you on those long trips or for people who never stop going. With its economical processor and smaller screen size, this 5-inch smartphone delivers a reliable performance without wasting excess power. The colorful HD display has a good level of brightness and nice depth of contrast. It features 2.5D curved glass and narrow side bezels which together make for a nice slyish design so it easy on the eyes. The 16:9 aspect ratio and a 67% screen to body ratio polish of the effect and make for a well presented and good looking phone. Under the hood, the M-Horse Power 1 smartphone has a MediaTek 6580A Chipset and modest 1GB of RAM, but with the Android 7.0 OS at the help its more than capable of handling your daily smartphone tasks. You get 8GB of internal storage on this smartphone and with a micro SD card, you can expand that to add a further 32GB of space. this should be more than sufficient for any music, films or games you want to install from the Google Play Store. The M-Horse Power 1 phone comes with 12 months warranty, brought to you by the leader in electronic devices as well as wholesale android phones.